Trump will not revoke Obama’s protections for immigrants who arrived in the United States as children. But his administration is still going after some of them. Ever since Donald Trump’s election, one major question has hung over the immigrant community. What would the new president do about Deferred Action for Childhood Arrivals, or DACA, the Obama-era program that offered young undocumented people who cleared a host of hurdles short-term reprieves from deportation? Late Thursday night, immigrants got their answer. The Trump administration will leave the program untouched, enabling DACA recipients to breathe a sigh of relief. But, announced Department of Homeland Security Secretary John Kelly, the Trump administration will revoke DAPA, or Deferred Action for Parents of Americans and Lawful Permanent Americans, President Obama’s attempt to provide administrative relief for the parents of DREAMers and other groups of undocumented immigrants. Throughout his campaign, Trump made statements that seem designed to rattle immigrants. He promised to immediately revoke DACA and DAPA in a 10-point immigration plan. (The document is no longer available on Trump’s website.) Weeks before the election, Trump released a Contract with the American Voter, his version of a first 100 days plan, in which he pledged to rescind DACA and DAPA, which he maintained were “unconstitutional executive action[s]…issued by President Obama.” Doing so would be his first immigration priority on his very first day in office, he said. Almost immediately after November 8, though, Trump started backing off that threat. “I want Dreamers for our children also,” Trump told Time magazine in December. We’re going to work something out.” Trump’s first day in office came and went with no action on DACA or DAPA, but during his first week in office Trump released executive orders directing the Department of Homeland Security to pursue all undocumented immigrants for removal from the United States, regardless of their background or criminal history, or lack thereof. In order to be eligible for DACA, young people have to have entered the United States before age 16 and still been under the age of 31 as of June 15, 2012, the day that President Obama announced the creation of the program. That young person also must have graduated high school and—in direct conflict with Trump’s claims—never have been convicted of a felony or more than three misdemeanors. DACA-eligible young people must meet a host of other criteria: The must clear background checks, hand over their and their family’s personal information to the federal government, and pay hefty fees. It’s estimated that almost 800,000 young people have been able to win DACA, which offers protection from deportation and work authorization for two-year stints, which are renewable. As of today, DACA-eligible young people may continue to apply for and renew their participation in the program. Importantly, DACA does not in and of itself change a person’s immigration status. Should Trump decide to rescind DACA as well someday, the nearly 1 million young people who’ve been able to work, go to school, and move freely for the last five years would become, once again, as vulnerable to deportation as the rest of the nation’s estimated 11 million undocumented immigrants. DAPA would have granted similar protections to an expanded class of undocumented immigrants, but the program never went into effect. After Obama announced its creation in 2014, 26 states, led by Texas, sued the federal government to block it, and it has been sitting in limbo after a judge temporarily enjoined it. As of last night, the program no longer exists. Despite the revocation of DAPA, many immigrant-rights advocates welcomed the news about DACA. “After months of senseless and cruel threats, the Department of Homeland Security’s decision to maintain DACA is a huge victory for the 800,000 young people who grew up in this country and have legal permission to live here,” Steven Choi, the executive director of the New York Immigration Coalition, said in a statement. Yet others are wary. Because with the Trump administration, there’s what it says it will do, and then there’s what it actually does. Recent events have shown that DACA status alone will not protect immigrants from arrest, detention, or even removal. In recent months, the Trump administration has done all three to DACA recipients. Back in February, just days after Trump announced that he’d show DREAMers “great heart,” 23-year-old Juan Manuel Montes was deported from California to his native Mexico even though he had active protection from DACA. In March, ICE agents circled Daniela Vargas’s Mississippi home before breaking in and attempting to detain her. When advocates and family rallied around her, ICE relented, only to pull her over on a highway two weeks later. She was eventually released after an aggressive organizing campaign led by Mississippi activists and national advocates. Vargas’s DACA status had lapsed while she had been saving up to pay the government’s $495 renewal fee. When ICE arrested Vargas, she had filed her renewal applications and also had her work permit. A federal judge recently ordered the federal government to reinstate the DACA status of Jessica Colotl, a 28-year-old Georgia DREAMer. The federal government revoked her status after claiming that Colotl had pleaded guilty to falsifying personal information after a traffic stop—even though her attorneys say she did not lie about her family’s information, and even though the charges against Colotl were eventually dropped. These cases, and Homan’s remarks, are as telling as actual policy, say advocates. The cases of Jessica Colotl and Daniela Vargas and Daniel Ramirez, a Washington State DREAMer who was also arrested and detained this year are only the most high-profile, Jimenez warns. 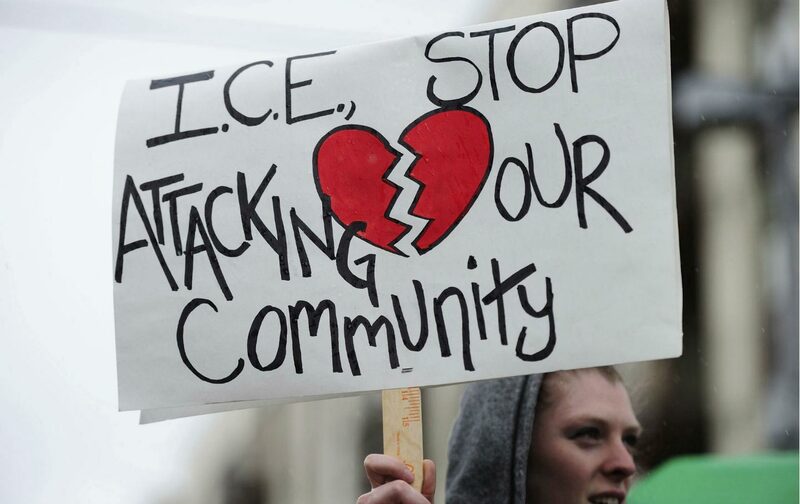 All benefited from access to local immigrant organizing and activist networks who were able to put in place a legal and PR strategy to fight for their rights to stay in the United States.